Do you own one of the latest Garmin Edge cycling GPS devices? If you do and you are looking at your options for loading additional maps for the UK and Europe we explain and cover all of the mapping options available to buy and use with your Garmin Edge bike GPS system. Garmin Edge 810, Edge 820, Edge 1000, Edge 1030, Edge Explore 820, Edge Explore 1000, Edge Touring, Edge Touring Plus. If you own an earlier (not listed) Garmin Edge device, then unfortunately Garmin no longer issue compatible maps for use with your model. 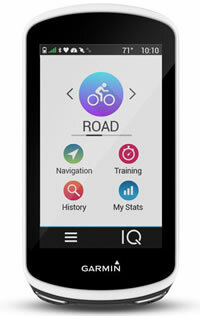 We sell a choice of three map options for use with the latest compatible Garmin Edge cycle systems. Learn more by clicking the following bookmarks, or by scrolling down this page to read more about each of them. Add UK and European cycle maps to your compatible Garmin Edge device with the genuine Garmin Europe Cycle map. Once installed the SD/microSD card enables you to select cycling, tour cycling or mountain biking options and then select the appropriate route for the type of cycling you do, taking you on paved roads, unpaved roads, or on paths and trails. 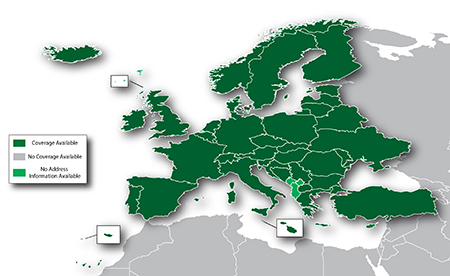 Countries included are: Austria, Belgium, Bulgaria, Croatia, Czech, Denmark, Estonia, Finland, France, Germany, Great Britain, Greece, Hungary, Ireland, Italy, Latvia, Lithuania, Luxembourg, Malta, Netherlands, Norway, Poland, Portugal, Romania, Slovakia, Slovenia, Spain, Sweden and Switzerland. (map coverage is pictured below). The Garmin Europe Cycle map pre-programmed SD card provides searchable points of interest (restaurants, hotels, hostels, trains stations, etc. ), cities, addresses and more. Read more and purchase the Garmin Cycle UK and Europe Map from ActiveGPS. 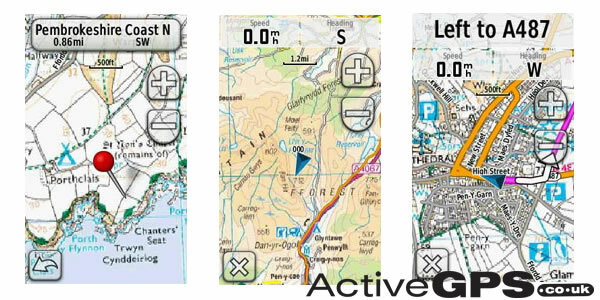 Garmin GB Discoverer maps feature full OS (Ordnance Survey) maps at a scale of either 1:25k or 1:50k. When these maps are loaded into a compatible Garmin Edge device they will display equivalent OS Explorer (1:25k) or OS Landranger (1:50k) maps on the screen of your Garmin Edge cycling GPS system. 1:25k scale maps cover specific National Parks and National Trails e.g. North Yorkshire Moors, North Highlands and Snowdonia. 1:50k scale map covers the all of Great Britain. The scale for England, Scotland and Wales is either 1:250k or you can zoom into a 1:50k. The scale for the Isle of Man is 1:25k. 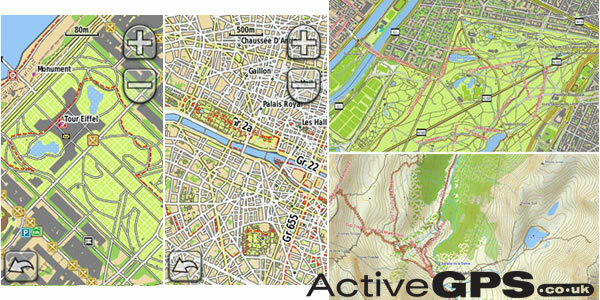 View and buy the available Garmin GB Discoverer maps from ActiveGPS. For cycling in Great Britain, the Garmin GB Discoverer map series (option 2 above) are the best available maps (for detail) to purchase and use with compatible Garmin Edge series models. However, if you are heading onto mainland Europe and require the same level of detail, then the TOPO map series are the maps to you should consider for use with your Garmin Edge cycle device. For example the Spanish TOPO map features and displays turn-by-turn street navigation for more than 2 million km (1.2 million miles) of road and trail network, with 56,000 km (35,000 miles) of off-road recreational trail. TOPO (short for topographic) maps feature contours, elevation, on road and off road navigation and at scale in some cases of 1:10K. However, all of the Garmin TOPO maps feature different scales, so please refer to an individual TOPO map for the scale. For example TOPO France maps features topographic vector map data from IGN at a scale of 1:25k. Pictured below screen shots from the TOPO France maps. Countries available in TOPO format include: France, Germany and Austria. All TOPO maps come supplied on DVD and/or plug-and-play SD/microSD Card. View and buy the available Garmin TOPO maps from ActiveGPS.